Who does not know English football club Newcastle United? One football club that competes in Barclays premier league is headquartered in Newcastle Upon Tyne, the Northeast of the English Country (North east of England). Geordieland, as some people call this city, taken from the word Geordie, the dialect that is owned by the local Tyneside. Not many know if this city is one of the interesting city to visit while being in England. Located in northeastern England which was part of Northumberland province until 1300 which later turned into the province of Tyne and Wear. In addition to being a city rich in commodities of wool, had also as a city of coal, glass, and steel industry in the middle ages. My journey this time, will get to know more attraction of this city. The hotel where I stay is located in front of St. Metro train station. James' Park is still in the middle of the city so just less than 10 minutes walk from the hotel, I've arrived at the city center. For those who like to walk, of course this is one of the easiest ways to walk around Newcastle city center. Starting from Northumberland Street which is also a pedestrian area with shopping centers, restaurants, and offices so that every day is always crowded. 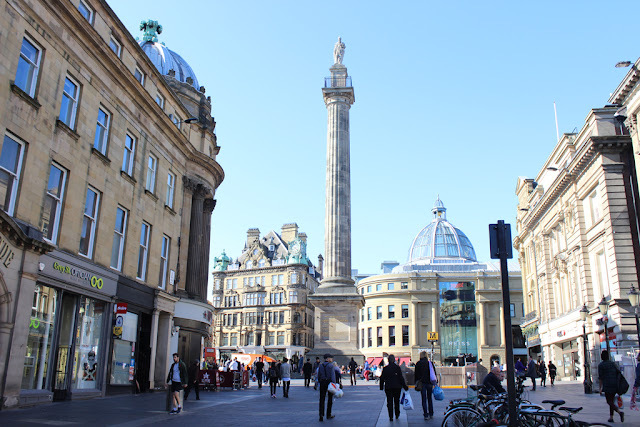 Keep walking past Blackett Street, there is a Gray's Monument which was inaugurated in 1838 as one of Newcastle's favorite places as well as a vocal point from Gray Street. Most of the buildings along the road are old enough and listed as important historical architecture, one of them is Theater Royal, where dramas, concerts and opera concerts are often held. Gray Street is one of several areas of Grainger Town that is quite historic for the development of the city of Newcastle in addition to Grainger Street, Clayton Street and Grainger Market. Accidentally the afternoon weather was friendly, sunlight gave warmth in the cold air at the end of April. Across the street, residents sit back at Old Eldon Square, the city park in front of the Eldon Square shopping center, one of the big malls in the center of town. Not far from here, Stowell Street; the location of the discovery of the walls of the old city of Newcastle. A 10-minute walk from the city center, I passed two modern campus buildings from Northumbria University's business school and School of Design. Quayside is one of the iconic areas along the River Tyne, quite historic for the development of Newcastle because it was once an industrial area and a very busy dock. 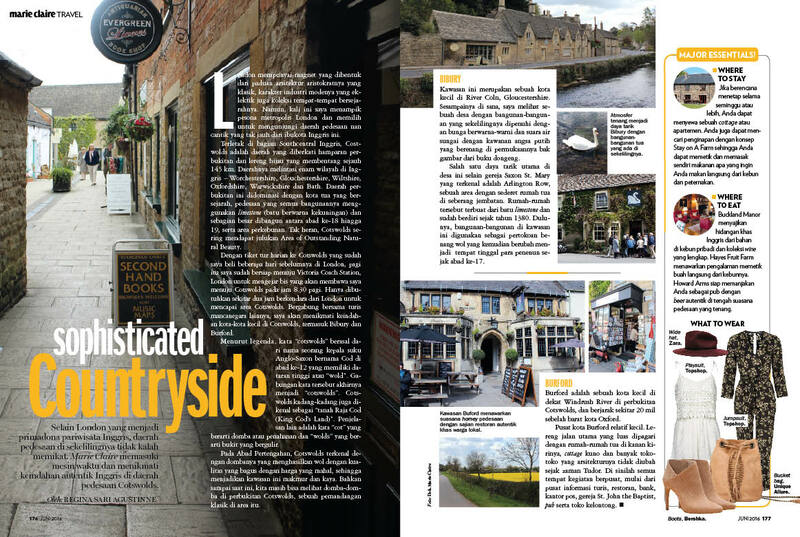 It has now developed into a tourist area, a place where old meets new with hotels, museums, venues, restaurants and bars. Here are some bridges that connect the city of Newcastle and Gateshead. One of them is Tyne Bridge which has been the hallmark of this city since 1849. One more is the Millenium Bridge with a modern design, pedestrian-only. Uniquely this bridge can be open if there is a large ship that passes through the River Tyne. 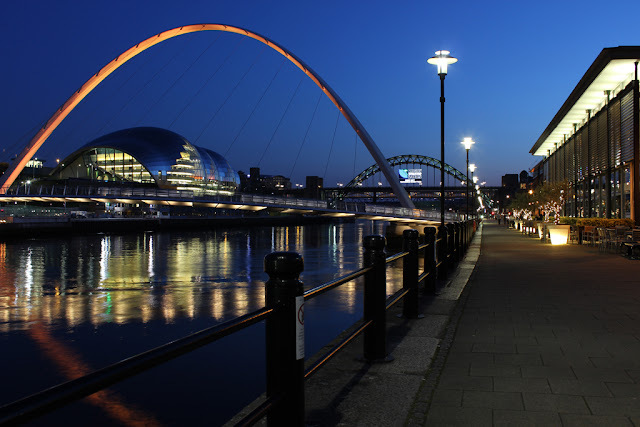 This bridge is an access to the museum of contemporary art BALTIC and THE SAGE music performances by renowned architect Norman Foster, whose building looks like a conch, whjere several international artist music concerts have also performed. I tried to stop by to see the art exhibition inside the BALTIC Museum. 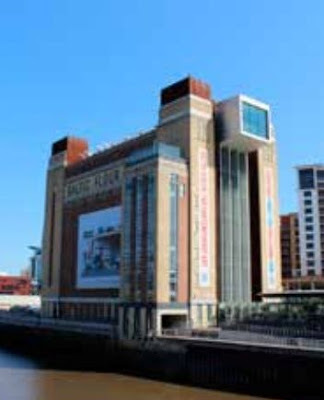 In addition to this museum is free entry, as well as want to see the views of Newcastle and the Tyne River from viewing gallery located on the 6th floor of the museum. Towards St. Nicholas Street, there is one bridge that is quite interesting, Swing Bridge. Opened in 1876, it lies behind Tyne Bridge, smaller and red in shape. 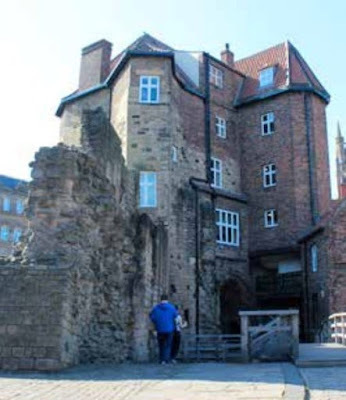 Walk a little uphill to St. Nicholas Street, there is a building that is the starting point of the name of Newcastle city, Newcastle's Castle Keep and Black Gate. I had to climb the steep stairs to the castle. I did not go inside, although the entrance fee was only £ 6.50 (Rp120.000). Outside, there is a board telling the history of the castle, in which there is a Norman Chapel and a well with a depth of 100 feet where water flows for life inside the castle. Just next to this castle there is a building called Black Gate. Built between the years 1247-1250 during the reign of King Henri III and formerly believed as a guard room to guard the palace from the enemy. Not far ahead, I saw a church, St. Nicholas Cathedral, built at the end of the 12th century and has been burned twice. At the top of the tower has a lantern tower that once served as a guide for the ship to the Tyne River. Football Stadium St.James Park owned by Newcastle United club has changed its name since 2012 to Sport Direct Arena. About 1 hour we went around looking at every existing facility, ranging from dressing room players and opposing players, the waiting room including the green field where the match took place. Bordered by Leezes Park, a large park behind the stadium that can accommodate 52 thousand ball fans every time, the only football stadium in England in the middle of town. 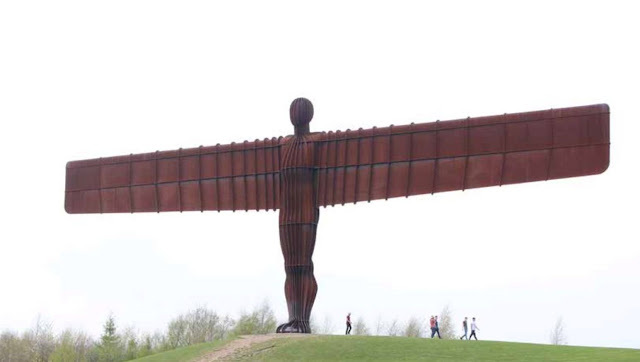 Angel of the North, a 20-meter-high angel-shaped silhouette with a 56-meter-long wing, is an iconic public artwork for the Tyne and Wear province. 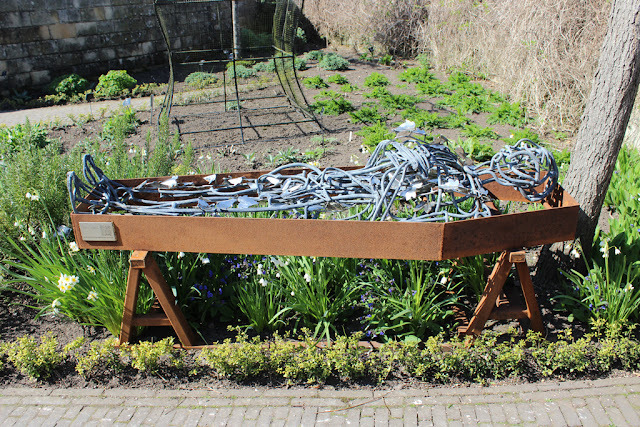 Built in the early 1990s on a former mining site by an English artist, Antony Gormley has the concept of understanding the transition of the Tyne and Wear province from an industrial city to a modern city today and focusing on expectations. Tynemouth is a historic town part of the Tyne and Wear region, about 30 minutes by metro train from Newcastle city center. A ten minute walk from Tynemouth metro station to the south or the Cullercoats metro station to the north, we can see the golden sandy beach with the eye-catching stone hills. Plus restaurants and cafes lined the city, not far from the beach. 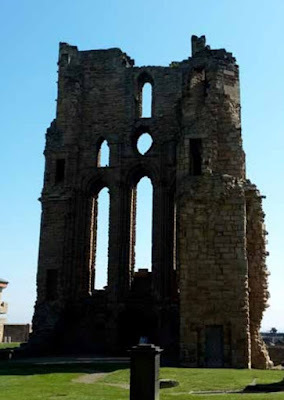 Not only the beach, located on the hill is still in the middle of the town of Tynemouth, there are ruins of historical sites relics of the period of the Anglo Saxon occupation, Tynemouth Castle and Priory built in the 7th century that was once used as a fortress, there are also churches, and palaces in the complex the building. From up here a 360 degree view of the northern English sea, the town of Tynemouth and St. Joseph's Lighthouse. Mary looks so beautiful. There is one of the famous fish and chips shops here. I walked to the Tynemouth Marshalls still in downtown Tynemouth to buy lunch and by chance this time the line was not long. While sitting in the city park, I sampled the fish and chips that were bought, the portions were quite large. 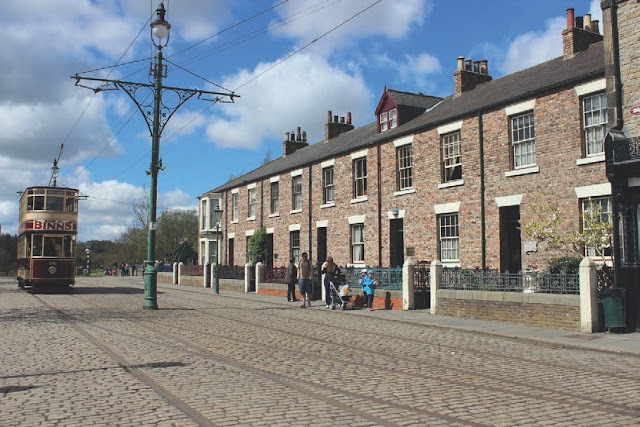 As an open air museum, the Beamish Museum tells the story of Northwest of England community life between the 1820s and 1940s. 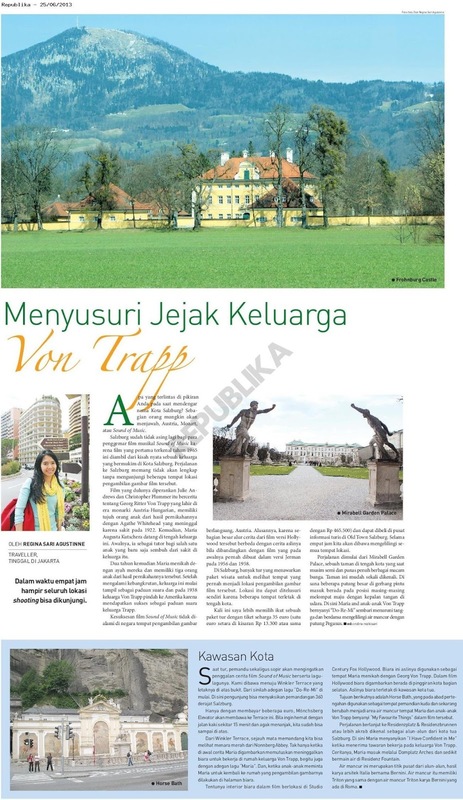 Admission price £ 25 (Rp464.000), it is not cheap but worth to visit. To be able to go to all these areas, visitors must ride a tram or bus that passes every 10 minutes at the museum's station. Entering the museum area, feels like a time machine that brought to the British era hundreds of years ago with rural atmosphere with the setting of 1900s. Visitors are presented with the atmosphere of the past. The next attraction is the farm with the setting of the 1940s during World War II. Visitors can enter each house and invite them to chat. Here there is a pig farm that one of the pigs always attracted the attention of visitors because it often perched through the fence cage. Using the tram that stopped at the next station, we arrived at a Rowley train station originally located near Consett in County Durham with Edwardian period setting and taken to the Beamish museum in 1976. A wrought iron bridge across the railway line. Various types of steam trains can be seen around this station and usually on weekends of passenger steam trains run at Rowley Station. Not far from Rowley Station, there was a hustle and bustle of the northern English towns of the time of the first world war. Like the city in general, here is the center of all activities. A residential neighborhood around the mall displays the daily life of its inhabitants with different livelihoods. That afternoon, while I was relaxing in a Redman Park city park, I saw an ongoing demonstration full of banners and crowds on the street. Well, I'm really in the past life of British society. Enjoy Newcastle further by going to Alnwick Castle which is in Alnwick Town, still part of Northumberland province. Have you ever watched the Harry Potter and the Philosopher's Stone movie and remember the scene when he learned a broomstick? This castle became the filming location of the film. Some activities are seen in the castle courtyard, including medieval costumes for children, Film location guided tour, playing characters with Harry Potter costumes and what I'm interested is broomstick training. Although i did not join it, but quite entertaining just by seeing it. visitors are taught techniques how to fly with broomsticks, and adults can also participate. Head to Alnwick Garden which is located on the other side of the palace complex. Alnwick Park is very beautiful when visited in spring and summer because it is filled with various colors of roses, treehouse, poison garden, and woodland walk.